Home / Articles / Does ExpressVPN work with Netflix? Netflix is amazing, I’m a huge fan. It’s revolutionised the way we watch entertainment and now it’s available across the world it has made entertainment global. Unfortunately, Netflix is heavily region restricted as they started cracking down on users making use of VPN services while watching Netflix. A few years back nearly every VPN provider in existence was banned and it was almost possible to find a VPN service that worked with Netflix. That has slowly been changing in the last 12-24 months and there are now a handful of VPN providers working with Netflix, but is ExpressVPN one of them? I’ve set out to answer this question, Does ExpressVPN work with Netflix? I’ve been testing their service with some of the most popular Netflix regions to find out. Discover what I found below. Yes, ExpressVPN does work with Netflix but it is not a 100% clear cut answer. While ExpressVPN works with some of the most popular Netflix regions it doesn’t work with them all. It’s likely you’ll be wanting to access the most popular Netflix regions such as the United States and United Kingdom because these have more exclusive content than most other regions. In fact, the United States is the number one Netflix region for English language content. Up until recently the United States had the number 1 catalogue for overall content but was recently surpassed by Japan which has added a lot of Japanese language specific content. If you’re after English and International content then the US version of Netflix is still where you want to be. But what other regions of Netflix does ExpressVPN work with? What Netflix regions does ExpressVPN work with? I tested some of the most popular regions of Netflix to see how ExpressVPN performed. I mainly concentrated on regions that have exclusive content that may be of interest to a worldwide audience. From my random testing, ExpressVPN works with 50% of Netflix regions and doesn’t work with the other 50%. The most pleasing result is it works with the United States Netflix region and for most people this is going to be the one you want to access. It has more than 1000 movies and TV shows over other English language regions so will certainly help you get more for your money. The United Kingdom Netflix region also worked which is great if you like British TV and the Indian Netflix region worked too so if you’re a Bollywood or Indian movie buff, you’re sorted. Sadly Japan wasn’t working so if you’re a fan of Anime or Japanese culture you’ll be disappointed here. Japan is one of the most difficult Netflix regions to access and so far I’ve only found StrongVPN to be able to access Netflix Japan. Sadly the French Netflix site also didn’t work but you may be able to find added French Netflix content on the Canadian site which did work. ExpressVPN is one of the best VPN providers when accessing Netflix because they support a whole range of devices. This includes phones and tablets running Android and iOS with computers running Windows and macOS also covered. ExpressVPN also has an additional Amazon FireTV and Fire TV Stick app so if you’ve got Netflix on your Fire device you’ll be able to tap into other regions too. Visit the ExpressVPN website by clicking here. Once on their website follow the instructions to sign up for their service. There’s a 30-day money back guarantee so you’ve got plenty of time to test it with Netflix. Click on the Products section of their website and download and install the correct app for your device. Once you’ve installed the app open it and login when required. 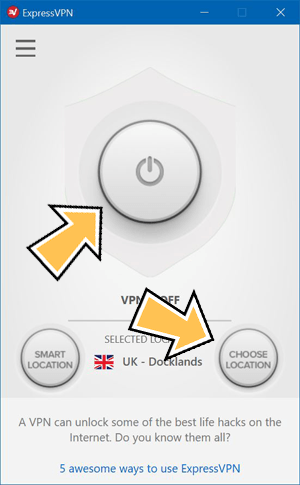 Press Choose Location, then All, click on the region then double click on the Country you require. The ExpressVPN app should start to make automatic connection but if not click the large Connect button. It will only take 30 seconds or less for the ExpressVPN app to connect. Once it’s connected you should visit the Netflix website or open the Netflix app on your mobile device. You’ll now be able to watch content only intended for that region with your regular Netflix account. For example, US Netflix users can connect to the UK to watch Annihilation etc. Below you can see an example video I made where I tried to search my local Netflix website for “Parks and Recreation” which is only available on the American Netflix site. It wasn’t found but after connecting to the ExpressVPN US Servers I was able to find it and watch no problem. ExpressVPN does indeed work with Netflix. It works with the most important regions for accessing more content namely the United States. It also works great with the United Kingdom, Canada and Indian regions. The service doesn’t work with all Netflix regions worldwide but it does work with those that offer more content enabling you to get access to extra movies and TV shows with your standard Netflix account. An added bonus is you’ll also be protecting your privacy in the process. To get ExpressVPN click the button below.